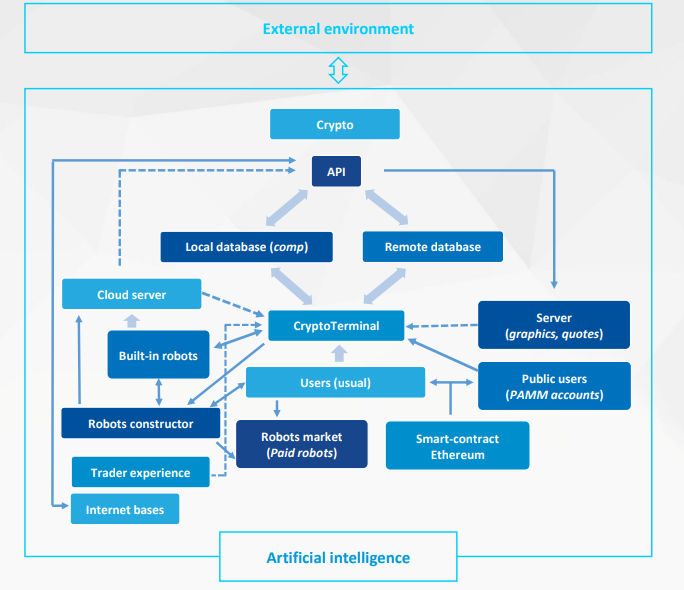 CryptoRobotics positions itself as a revolutionary trading terminal for comfortable trading with PCs and mobile devices based on iOS, Android and Windows Mobile. The project team declares the revolutionary nature of the project interface, allowing you to switch between different crypto assets at a record low speed. The menu system provides many popular trading tools for fundamental technical analysis of currency pairs. Functionality of CryptoRobotics is not inferior to exchange offices, which allows using all the advantages of the technical component. The ICO phase will affect 57,600,000 ROBO tokens based on the Ethereum network and the ERC20 marker. The company expects to collect at least 1,000 ETH. Minimum investment of 0.1 ETH can be made at the current exchange rate of 0.00015 ETH per 1 ROBO token. The hardcap of the project is fixed at 7.848 ETH. A total of 40% of the total mass of tokens is available, so as not to create an artificial imbalance of the ecosystem, but to collect the necessary tools for development. Currently, cryptographic terminals are very expensive and do not support multiple platforms at the same time. It is difficult to benefit from the inequality of the price of crypto currency (arbitration), because the transition from one service to another requires a lot of time. None of the existing trading platforms use technical analysis tools. According to the road map of the project, as early as September 2018, automatic robots and robot advisers will be launched. In February 2019, the demo test of the Trader experience service will begin. By August 2020, it will be possible to test trading robots based on artificial intelligence.